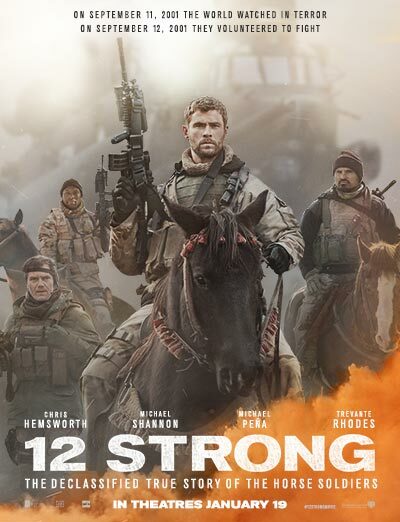 12 Strong is based on a true story about a Special Forces team in Afghanistan that teamed up with a local warlord to fight the Taliban. Directed by Nicolai Fuglsig, whose only previous film was Exfil, this military drama does a good job developing interesting characters to keep audiences vested in the story. There’s some wild battles that culminates in a suicidal cavalry attack in the end, but at the heart of this movie, it really does come down to the characters. And in the leading role, Chris Hemsworth does a great job as the Special Forces captain leading his team and struggling to find a way to win a war with horse soldiers and an unpredictable warlord. This one is definitely worth seeing on the big screen for the battle scenes, and it has some good re-watchability potential. I give it a five out of five metal bikinis.